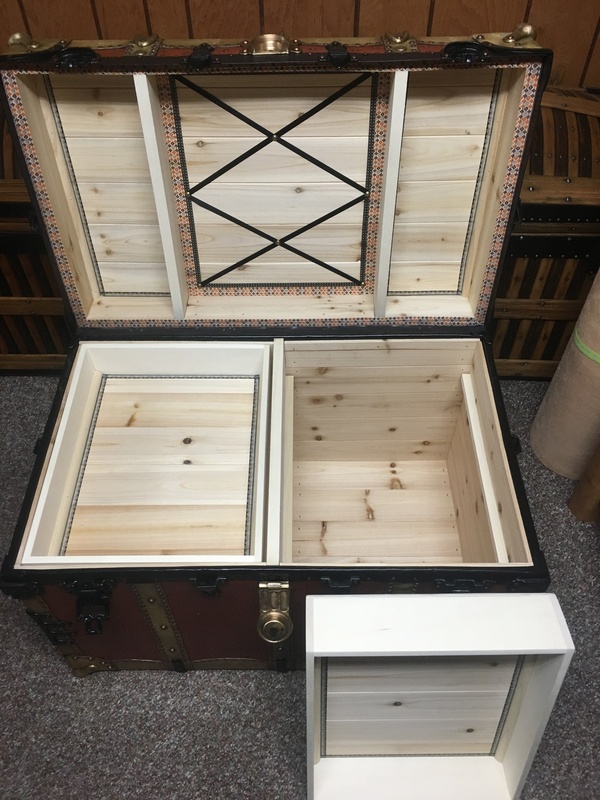 BB&B Vulcanized Fiber And Rawhide Trunk 1890's to 1910 ? 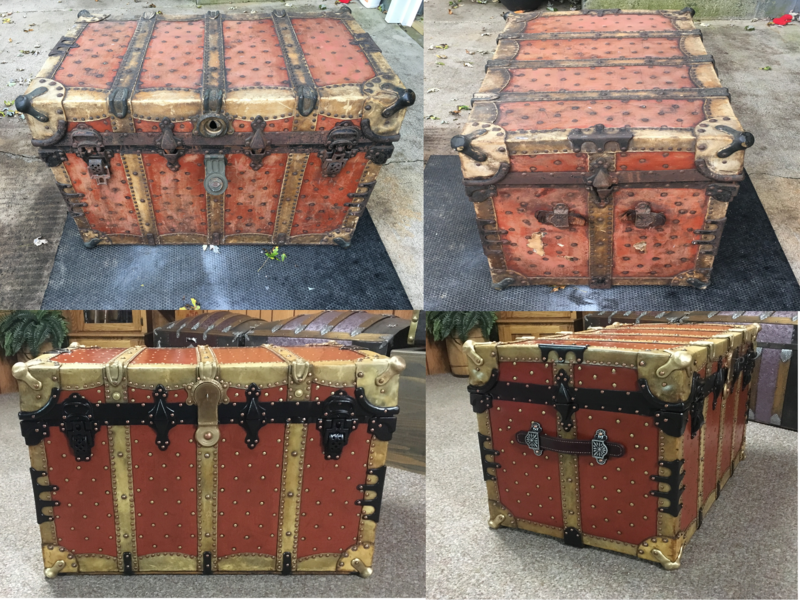 I posted this one a few months ago, just finished the outside of it today. This trunk was another challenge, when I got it, the lid wouldn't close, it was warped six ways to Sunday, the lock was bent and broken, some of the hardware was broken, it had two really bad mouse chews on the top front and back right hand corners through the rawhide right down into the wood, and I probably paid more than I should have given it's condition, after working on it for a while I became so frustrated with it that I had to walk away from it and didn't touch it for over a month, as you can see I persevered it just took a little time and patience. 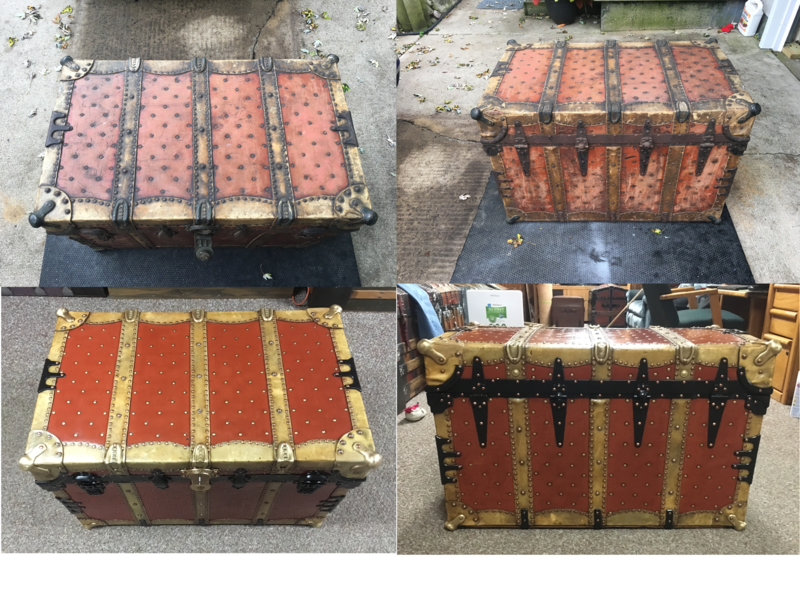 I don't know much about BB&B trunk co. except that they were three brothers and had two factory's one in Allegheny and one in Pittsburgh PA. this trunk was made in Allegheny, I also read that they were not in business for very long, 1890 to 1910 or so, if anyone has any information on BB&B, I would like to hear it, as far as the interior go's I will finish it out in white ceder and make a simple tray for it, this trunk was a lot of work I hope you like it, greendog. Thank's very much AnnaB, and yes very proud of this one, and your absolutely right, I become very attached to them and sometimes there very hard to let go of, thank you again, greendog. Thank 's Ben, yeah this was a tough one, greendog. Thank you hunterglee, GateKeeper, blunderbuss2, fortapache, WillysVA, yougottahavestuff, EJW-54, and MMNorth, thank you all, greendog. Wonderful trunk Brian ,A brief Oct. 1911 historical mention of B.B.&B. 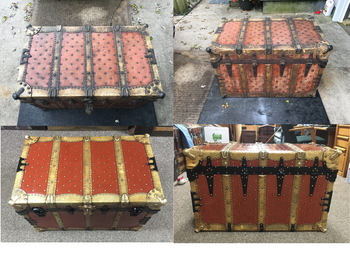 Thanks again Drill, it would be nice to know what year that was, I was also looking at your H.C. Faber trunk you posted about four years ago, and how much they look a like, very similar in style with the rawhide and brass hardware. 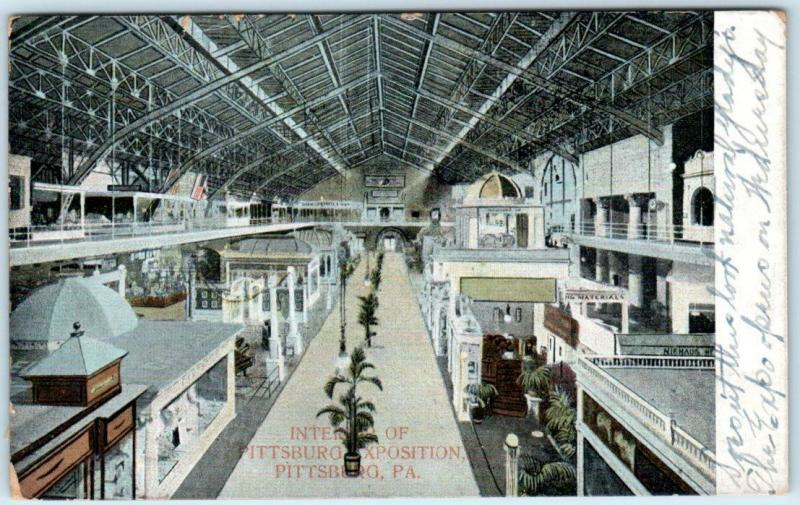 This was apparently set up at the Pittsburgh Industrial exposition- luggage and leather goods article oct. 1911 above is a postcard of the 1911 event. OK AnnaB, the red color is vulcanized fiber not leather, I think it was patented in 1860's in Europe and again in the 1880's in america, it's not plastic and it's not rubber, it's a very dense fibrous material, it is very weather resistant and was used by the military for foot lockers equipment boxes and such for that reason, this trunk I believe was made or used on the back of an early automobile. Vulcanized fiber can be sanded and cleaned with steel wool and stained to enhance the color, vulcanized fiber is hard to find in good condition, it's usually cracked and and will bubble up after a hundred years or so. the lighter material is rawhide leather. AnnaB, in case you were referring to the rawhide leather mouse chew repairs, I used JB weld kwikwood, it's an epoxy type wood filler that adheres to wood as well as many other materials, the repairs are so good that if you didn't know you couldn't tell. Thanks hunterglee and officialfuel, greendog. Hey thanks Tom, yeah took me awhile to figure out how to do the photos but I got it. -PNG format is a lossless compression file format, which makes it a common choice for use on the Web. PNG is a good choice for storing line drawings, text, and iconic graphics at a small file size. -JPG format is a lossy compressed file format. This makes it useful for storing photographs at a smaller size than a BMP. JPG is a common choice for use on the Web because it is compressed. For storing line drawings, text, and iconic graphics at a smaller file size, GIF or PNG are better choices because they are lossless. -JPEGs are for photographs and realistic images. PNGs are for line art, text-heavy images, and images with few colors. GIFs are just fail. All the best! Did you understand all of that Brian? Thanks for the info Tom, appreciate it. It took me a while Ben but I think I've got it. I posted a B.B.&B. Trunk ink blotter about 7 mos. ago. It gives adresses for 3 stores and factory address also. No problem AnnaB, and thanks again. Also AnnaB, the entire trunk was cleaned with Murphy's oil soap and a metal cleaning scotch bright pad and nylon brush the rawhide and the vulcanized fiber, I almost dyed the rawhide black because it didn't come as clean as I wanted, but as you can see I didn't. greendog. 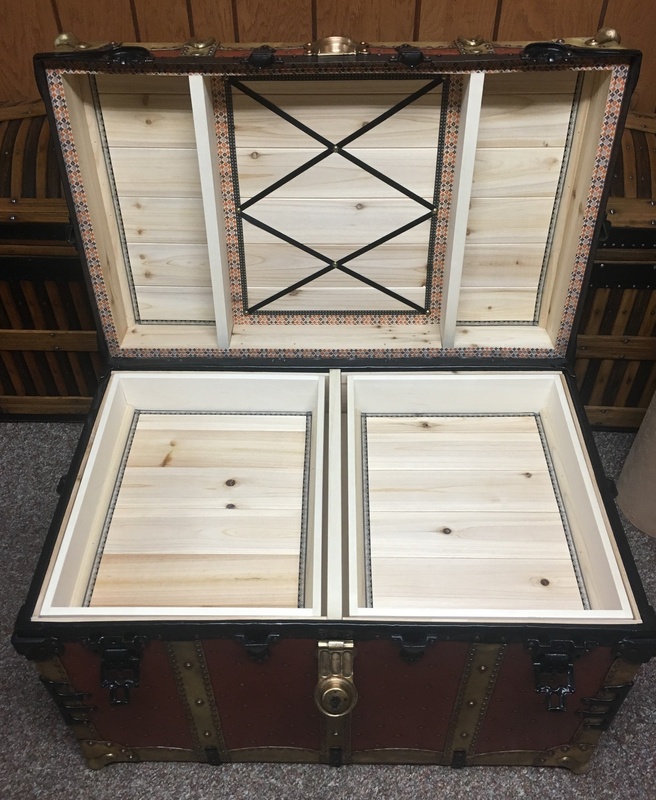 Finished the interior on this one, done in cedar, greendog. Thank you chrissylovescats and Beachbum58. Thank you purvis, vintagegril66 and snowman3. Thank you SEAN68 and trunk20.